While brightly hued wedding cakes seem to be all the rage right now, there’s something to be said for an elegant all-white cake. Think of an all-white wedding cake as a blank canvas. You can add any kind of embellishment from fresh flowers to greenery, and even a peek of modern art in the icing. Take today’s featured cake fore example. 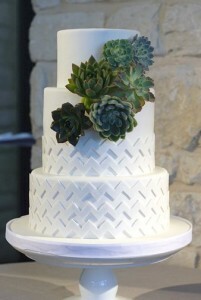 The three-tier cake has a modern and elegant look thanks to some chevron in fondant and the addition of lovely green succulents. It’s all this cake needs to be gorgeous. The design is simple and modern and absolutely perfect for a summertime wedding. Want more color? Consider bright colored flowers in place of the succulents. Or have the chevron design added in color. You can find this cake here. It was created by Coco Paloma Desserts.